Back in 1987 we saw the start of something called "Flying Winemakers"...top young Aussie winemakers flying over to help with the European vintage. Shock! Horror! But...the new ideas, the energy, optimism and talent really benefitted Europe...and...Europe gave the Aussies a lot of ideas in return. Like Red Heads, for example. See...the "flyers" got frustrated when they flew home to dull jobs in the mega wineries of the ho ho! "rationalized" Australian wine industry. They envied their French and Italian mates who made just the wines they wanted to make. With no money to set up their own wineries, they just made a few barrels in garages. Fantastic wines came out of tin sheds! Wine shippers in Britain and the US loved the stuff. They got backing and set up Red Heads in an old bar that they bought on the road out of McLaren Vale to Barossa. 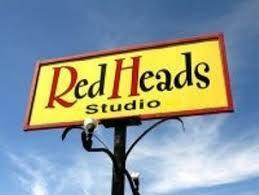 Red Heads was the name of the bar. Great name! They kept it. This is now where the keenest winemakers come after work to "do their thing." British, American, Aussie and even French customers love the idea of these red wine "heads" fanantically working away through the night making the great little wines they always wanted to make. Justin Lane made just four barrels of his own in his garage. But also had a mate, 'Philbo', who made rather more in a bigger tin shack on Chalk Hill that he'd kitted out for bugger-all with cheap rainwater butts, garden hose, a converted milk chiller, clapped old pumps and casks scavenged from behind Hardy's. The mantra of Red Heads still rings aloud, 'Drink more wine!' The collective garagistes are still pushing it hard and producing some crazy juice. The Cab Sauv hails from three sites in the Vale as well as Fleurieu and Langhorne. The 'Yard Dogs' of Lagrein (southern Adelaide Hills), Sangiovese (Barossa Valley) bring a bit brighter and fleshier tone than previous incarnations. The Merlot (Langhorne Creek & McLaren Vale) softens things up a bit. Robert Parker 90 "As the hilarious label says, Hear No Evil, See No Evil, Taste No Evil.